The first review posted on the old site in 2002. 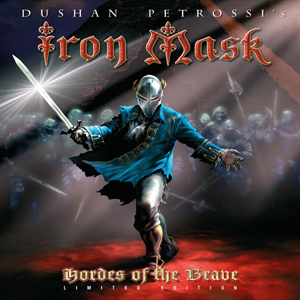 Iron Mask is the side project of Magic Kingdom lead guitarist Dushan Petrossi. With a sound firmly planted in the neo-classical genre the obvious comparisons are going to be thrown towards the mighty Yngwie. But to those that have more than a passing interest in this genre can generally get round the influence that Malmsteen seems to have on everyone in the genre and just get on with enjoying the music that is on offer. Its with this outlook that we move onto Iron Mask. “Revenge Is My Name” is a concept album based around the story of ‘The Man In The Iron Mask’, first of all this is detour from the normal neo-classical lyrical subject of vikings etc. To be perfectly honest I didn’t pay too much attention to the lyrics or the vocals except for one track – “Hold The Light”. Maybe the reason this track stood out is down to the fact that it features a different vocalist in Max Leclerq, whilst the rest of the album is handled by the relatively average sounding Phil Letawe. Letawe falls into the trap of the normal neo-classical vocal histrionics and generally came across sounding a little uninspired. Whereas Leclerq had a much more positive delivery, albeit on the most commercial sounding track on the album. The bass and drum performances are very solid, brimming with energy and precision on the instrumental “Morgana’s Castle”. 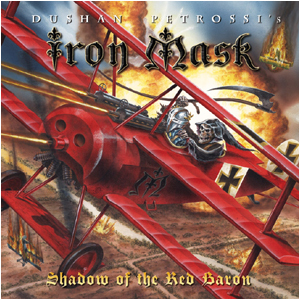 But the star of the show is the man with his name on the album cover – Dushan Petrossi. The guitar work is of the very highest caliber, it bristles with harmonic excitement, speedy riffs, harmonised runs, and the gamut of solo flights to make even the most hardened air guitarist feeling exhausted. Yes there’s a lot of guitar on this album but there’s also a lot of melody. Petrossi shows considerable skill when it comes to incorporating classical pieces into rock textures. Silky arpeggio work outs are deftly followed up by pedal point movements before roaring to a crescendo of super tight speed picking – this kid can play! Standout cuts include the concerto-esque opener “Enemy Brother Overture”. “March Of Victory” has a very classy opening with grand piano over which Dushan laces subtle acoustic work before blasting into a prime riff. This is pure neo-classical glory and Letawe’s vocals do work well here, sounding like a slightly gruffer Joey Tempest. The chorus is superb on this one, the riffing underneath again working its wonders. “Morgana’s Castle” is an impressive instrumental workout, one that Ynwgie and Johansson would be proud off – great stuff. 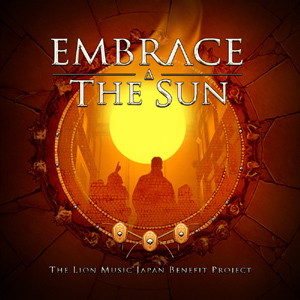 “You Are My Blood” sees the huge european vibe continue in this ballad, this could easily have come from Malmsteen’s ‘Eclipse’, the quality is that good. “The Wolf & The Beast” clocking in at over 8 minutes could be viewed as the “epic” of the album, luckily the song structure backs up this view with its great rampant riffing and strong orchestration. Petrossi’s guitar work is again superb throughout getting a lot of solo time here. “Hold The Light” is by comparison quite a contrast to the rest of the album in terms of style, coming across as more prime late 80’s commercial metal, the track is stunning, great riff, great verses and chorus and all backed up by Petrossi’s superb fretboard flurries. As stated earlier in the review the vocals of Max Leclerq of Dushan’s other band Magic Kingdom go a long way to making this track standing out, also the production seems to be stronger than elsewhere on the album with better mix and a superb blend between guitar and orchestral movements. The album is worth the price of purchase for this track alone! “Revenge Is My Name” is for the bulk an enjoyable slice of neo-classical metal, the production does let it down in places, but then Dushan is not working with the kind of budget Malmsteen has. Even so the quality of the album shines through for the most part and the main blip of the vocals eventually fades behind the superb guitar work and other band performances. Fans of Malmsteen will get a lot from this, as will fans of quality guitar work. Hot Spots : March Of Victory, The Wolf & The Beast, Hold The Light, Warchild Requiem. 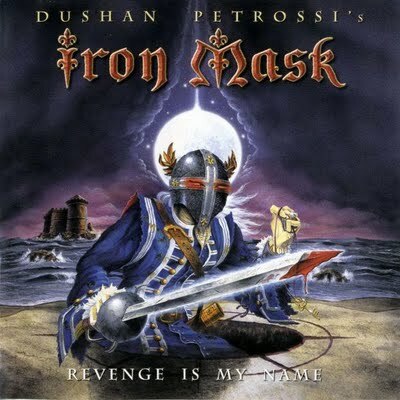 This entry was posted in Reviews and tagged Dushan Petrossi, Iron Mask, revenge is my name, review. Bookmark the permalink.